Dubai is a home of amazing skyscrapers and almost all of them are engineering marvels. 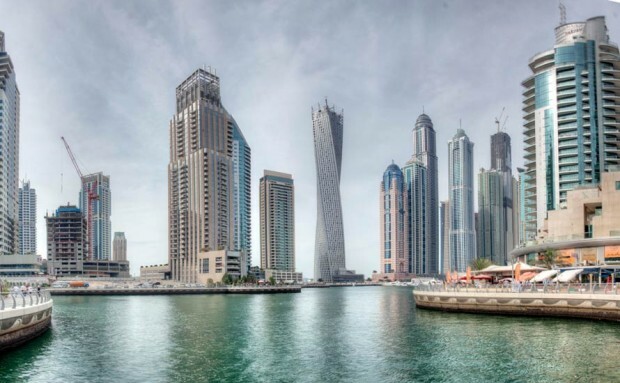 This week Dubai has inaugurated Cayan Tower – world’s tallest twisted tower located at Dubai Marina. With 310metre height and 75 floors housing 495 appartments, Cayan Tower is twisted at 90 degree angle from bottom to top with each floor is rotated by 1.2 degree. It took seven years and $272million to build up the marvel of modern engineering. The residential tower’s construction started in 2006 but had to stopped due to major flooding in basement and then the credit crunch or financial crises effect in 2009 forced the delay and then finally completed in June 2013. The Tower was designed by Chicago-based Skidmore Owings and Merrill, Same company who are masterminds behind World’s tallest building Burj Khalifa. And developed by Cayan Real Estate Investment and Development Company. According to Cayan Real Estate Investment and Development Company, 80% of residential units are already sold. On a secondary market property website, a one-bedroom apartment carries a price tag of $435,000. The Tower includes Residential apartments, Swimming Pools, Tennis Court, Nursery for infants, Gym with a Spa and many other amenities.